As my work moves more towards illustration and print media, I am moving forward with a few new series based in printmaking. I want these series to flow more cohesively, and in an effort towards unity in this new direction, screen printing and letterpress will be the media focus in these works. I have begun one of these series based on my love of all things C.S. Lewis, especially his thoughts on storytelling and imagination ("fairy stories" as he called them). I recently challenged myself to read through the complete Narnia series after 1. being encouraged to spend more time reading and 2. being increasingly intrigued with a fairly well known quote from The Lion, the Witch, and the Wardrobe: "...he isn't safe but he's good." In these print series, I am illustrating the Narnia books anew by pulling out sections that speak to me, giving them a fresh look, and hopefully inspiring new and seasoned Lewis readers alike to visit these and other imagination-encouraging tales. While I know that The Lion, the Witch, and the Wardrobe is not chronologically the first in the Narnia books, I have started with illustrating it (instead of The Magician's Nephew) for a few reasons. 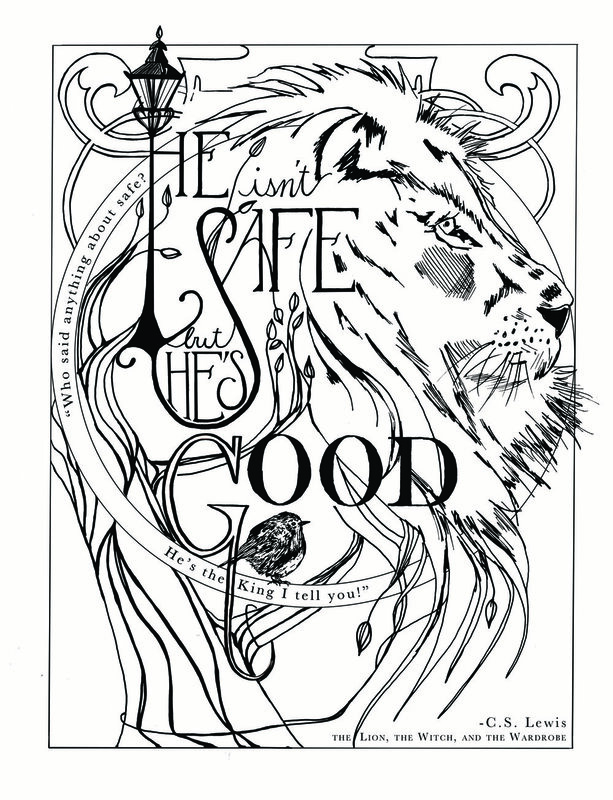 The first is mentioned above, that the quote about Aslan being not safe but good is what originally drew me into making these works. 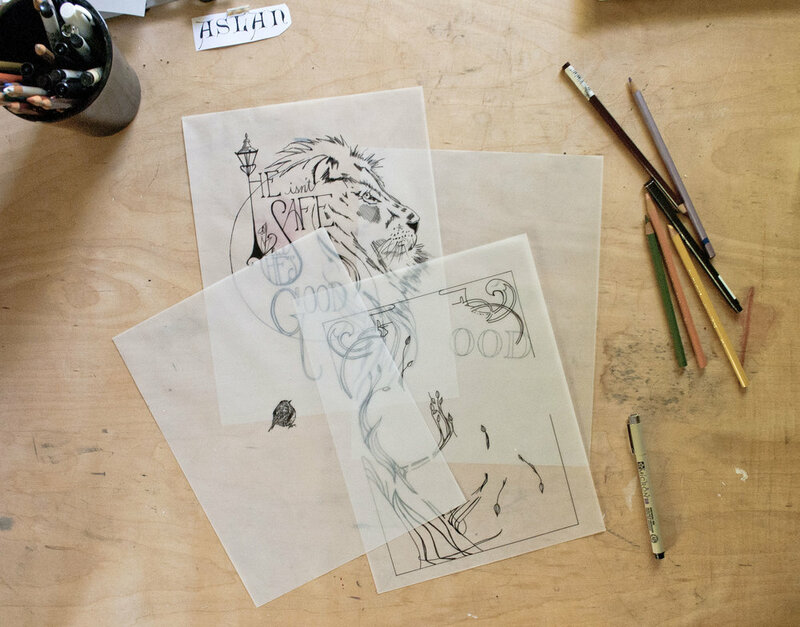 The second is that by starting with the book that most people are familiar with, these prints will hopefully cultivate a desire in readers to dive further into the other Narnia books. Solidifying the design --- And I think its worth mentioning, I am really loving Art Nouveau stylization lately. I like the repetition of organic shapes en masse and I feel like the Art Nouveau style lends itself well to fantastical stories illustrated in print format. Hopefully I can bring Art Nouveau color themes into these as well. After getting the sketch to where I want to finalize it, I redrew the piece using transparent vellum paper and sharpie for a clean finish. I created this using two layers of vellum because I wasn't too sure if I liked the addition of the tree and design elements that pushed it beyond a circle format and into a circle within a rectangle (again another Art Nouveau inspired style choice). Now that I've got the illustration drawn, the next step is digitizing! I'm scanning these two layers and editing them further in Photoshop and Illustrator. My intention is for this series to be done with screen printing (the same process that is used most often to make t-shirts; many artists use screen printing for making poster-like prints as well). So I need to get this image as clean (pure black and white) as possible. Then it will just be a matter of printing out the "stencil" on transparency paper to burn onto my screen. Next up I'll show you my process of turning my drawing into a digital illustration.